The results indicate descent correlation between methods used for the experiments attempted. I plan at some point to expand the testing at a future point as well as get the receiver boxed up…we’ll see how that goes! 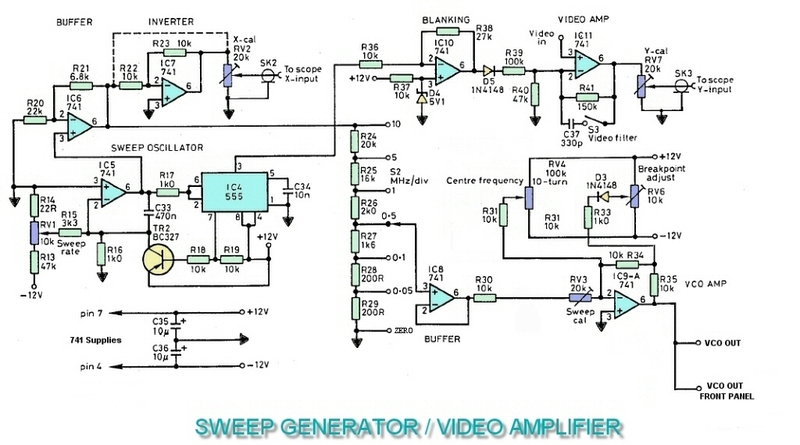 Categories: Amateur Radio, DIY Spectrum Analyzer, Electronics, Homebrew Spectrum Analyzer, MC3356 Spectrum Analyser, Spectrum Analyser, Spectrum Analysis, Spectrum Analyzer | Tags: Amateur Radio, DIY Spectrum Analyzer, Homebrew Spectrum Analyzer, MC3356 Spectrum Analyser, Spectrum Analyser, Spectrum Analysis, Spectrum analyzer | Permalink. Well I’d like to report I’ve made significant progress on enclosing the MC3356-based Spectrum analyzer but in fact I’ve accomplished little to this point. I managed to get a suitable module arrangement that will work with the chosen box (it’s really a bit small but, it’s what I have). Secondly I made a quick pass on a front panel template (below). But my attention wondered a bit when I ran across a post concerning a Python-based spectrum analyzer (PyDSA) which uses a Rigol DSO as a digitizing front end which feeds a data acquisition software based system. The program code was originally written for use with a Rigol DS1102 model but revisited in order to accommodate a DS1054Z scopes programming requirements. My familiarity with Python was pretty much zero (and still is) when I began to setup the python environment on my Win7 x64 machine. Fortunately the process was straight forward enough to get things going after a little on-line reading. But, there was definitely some glitches along the way. Getting one of the program’s dependencies installed proved to be a challenge that lasted for a few days of frustration. PyVisa 1.4 simply would not install no matter what I tried. I was ready to give up on this till I made a slight change in the programs .cfg file which amazingly worked…don’t know why. In my case there’s a caveat…I was unable to to get the auto-scan to function properly whether I tried the PyDSA .py file or the compiled version. I think it must have to do with my Rigol DS1054z DSO and it’s firmware rev…don’t know for sure. So your mileage may vary. It does however work well in single scan mode. If you have any questions leave a comment. Happy to help. 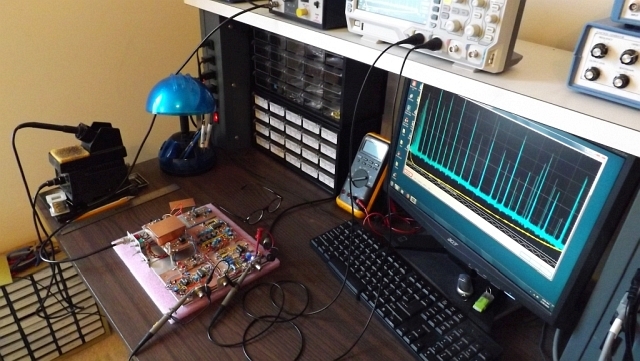 Categories: Amateur Radio, DIY Spectrum Analyzer, Electronics, Homebrew Spectrum Analyzer, MC3356 Spectrum Analyser, Python, Spectrum Analyser, Spectrum Analysis, Spectrum Analyzer | Tags: Amateur Radio, DIY Spectrum Analyzer, Homebrew Spectrum Analyzer, MC3356 Spectrum Analyser, Spectrum Analyser, Spectrum Analysis, Spectrum analyzer | Permalink. While our house moving is ongoing I’ve still a few things which haven’t been boxed up yet (and a few I’ve unboxed…don’t tell my Wife please!). A few of the bits & bobs I’ve uncovered recently are the MC3356 Spectrum analyzer boards and it’s intended enclosure. Time to do something about it I’m thinking. But first, Let’s see if the SA fared well enough after being relegated to storage for a while. Getting things hooked up again it would seem all is well but needs a calibration re-visit. Looking at the VCO ramp linearity the breakpoint adjustment was a bit off. Along with this change I would recommend using a multi-turn pot for the center frequency adjustment R31. If not you might want to add back in the fine frequency control which I had previously removed. Here’s an additional plot of the 10MHz sine output from a previous project, the RF sweeper…The zero spur is located at the far left (normal for a superheterodyne SA and good for a calibration point). secretary of the GQRP Club (G5LOW), which he founded in 1974 to cater to those interested in low-power Amateur Radio communication. Dobbs served as the editor for the club’s quarterly, SPRAT. Dobbs was the author of QRP Basics, The International QRP Collection (co-authored with Steve Telenius-Lowe, 9M6DXX), and Making a Transistor Radio. Categories: Amateur Radio | Tags: G3RJV, George Dobbs | Permalink. Well moving time is upon us. Time to pack it all in and hit the road to a new house. So forgive the lack of posts recently, well for some months really. Once things settle down a bit I’ll be back! Categories: Moving | Tags: Moving, On the road | Permalink. The compact stellar spectrograph (LRCSS) has been coming along nicely. I needed to cut a slot in one of the M42 extenders to accomidate the imaging lens focusing adjustment. Turned out OK although not my finest metal work…Here’s a few current images of what I’ve got. In a future post I’ll capture a few additional photos of the spectrograph construction that I neglected to provide above. Next I decided against doing a part 2 of the RSpec spectroscopy software review. Turns out, at least on my current Win7 machine, the needed DirectX drivers (for the ZWO camera) did work but not terribly well. The software video controls are a bit simplistic for my tastes. I think I prefer using Sharpcap for acquiring astro images and video captures. For $15US one gets the additional polar alignment feature as well as dark frame subtraction during live captures and live histogram views. It works well, although doesn’t provide the live spectral profile view which is nice. I’m back to VSpec (freeware) I’ve used in the past for spectral analysis along with a relatively newish program called BASS. What’s next…Oh I assembled a rather simple illuminated cross hair for the right angle 35mm finder I recently put together to make finder viewing a bit less of a yoga exercise and more of a comfortable experience. And it does! Categories: Amateur Spectroscopy, Astronomy, Astrophotography, DIY Spectrograph, Orion clock drive, ZWO ASI120MC Camera | Tags: Amateur Spectroscopy, Astronomy, Astrophotography, DIY Spectrograph, Orion clock drive, Spectrograph | Permalink. Here’s a spectrogram I recently captured using Sharpcap of a portion of the solar spectrum covering the Sodium doublet to the Magnesium triplet (~ 515.4 to 591.25 nmeters). Next time I’ll give RSpec’s built in video input capabilities a go and see if we can capture live spectra of our nearest star. Categories: Calibration lamp, DIY Spectrograph, Solar spectrum, Spectrograph, Spectroscopy | Tags: Amateur Spectroscopy, DIY Spectrograph, RSpec, solar spectrum, Spectrograph, Spectroscopy | Permalink.